Rep. Tulsi Gabbard at Standing Rock. “This is a historic moment for the Standing Rock Sioux and the water protectors who have gathered here from across the country. This announcement in effect requires the Dakota Access Pipeline to be rerouted—an essential step in protecting water for millions of people in this region as well as respecting this sacred land. “In my meeting yesterday with Tribal Chairman Dave Archambault, he emphasized the importance of caring for our planet not as a resource, but as our relative. Water is life; we cannot survive without it. Whether it’s the threat to essential water sources in this region, lead contamination in Flint, Michigan, the potential threat posed to our water by the Red Hill fuel storage facility on Oahu, or the many other threats to our water across our nation, we must act now to protect our precious water for current and future generations to come. 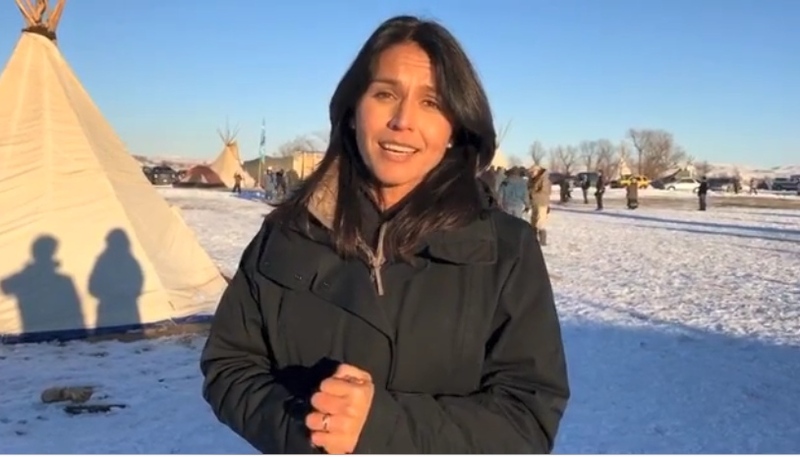 Last weekend, Gabbard, who served in the Iraq War, and thousands of other veterans from across the country joined the water protectors at Standing Rock to stand in solidarity and call for an immediate halt to the pipeline’s construction. She returned to Washington, D.C. on Monday in time for votes in the House of Representatives. On Dec. 1, Gabbard spoke on the House floor to urge President Obama to block the pipeline.